The Samsung Book 9 Lite certainly has its flaws – its low-grade display means limited viewing angles that would be unacceptable in anything other than a budget laptop. However, its performance is rescued by that solid-state drive, while its attractive slimline design and impressive battery life are unmatched by just about any other laptop in this price range. All told, the Samsung ATIV Book 9 Lite may have a passing resemblance to the highly rated Samsung ATIV Book 9 Plus, but it's only skin deep. Even among other entry-level ultrabooks and desktop replacements, the Book 9 Lite has frustratingly slow performance and only middling battery life. For a better touch-screen laptop at a similar price, the Editors' Choice Lenovo IdeaPad U430 Touch is still the better option. The ATIV Book 9 Lite is a practical choice for business travellers looking for reasonable performance with light productivity applications such as word processing and Web browsing—even if there aren’t the eye-catching features you’d expect from more expensive machines such as a brushed-aluminium chassis and a Full HD display. AMD processors aren’t known for their speed. 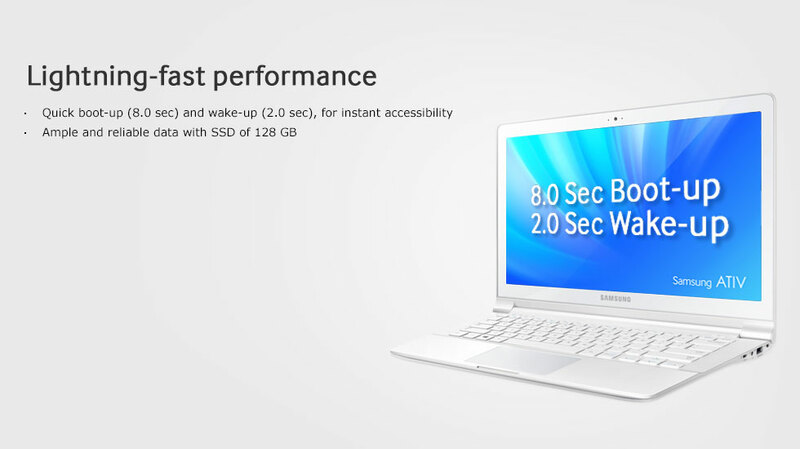 The Ativ Book 9 Lite delivers good performance with productivity applications, such as word processing, Web surfing, and light multimedia usage. It delivered a Notebook WorldBench 8.1 score of 198. That puts it on a par with some of the other Ultrabooks we’ve tested, such as the Asus B400A Ultrabook (197) and the Lenovo IdeaPad U430 Touch. It’s twice as fast as our benchmark testing unit, the Asus VivoBook S550CA. If you don’t have one of these other Samsung devices, or if you do, but don’t intend to use the Ativ Book 9 Lite as an extension of it, look elsewhere. You’ll get a higher-quality laptop for a lower price. Samsung's ATIV Book 9 Lite derives its name from the lack of features and its lower price than its other ATIV Book 9 laptops. The problem is that it sacrifices a bit too much to be a really recommended system for those looking at a more affordable ultrathin laptop. Its performance is less than other systems in that price range. There’s a lot to like about the Samsung ATIV Book 9 Lite. It’s relatively thin and light, offers decent day-to-day performance, and up to 6 hours of battery life. If it weren’t for the fact that I spent $800 on my Series 9 notebook a year ago and got a model that’s thinner, lighter, and faster, it’d be a lot easier to recommend the ATIV Book 9 Lite. I started off liking the Samsung Ativ Book 9 Lite. Its plastic casing didn't bother me as I appreciated its light weight and slim form factor, carrying it around a lot and rarely running out of juice. The graphics performance was also pleasing, on the whole. Even the vague suggestion that this laptop could be running a tablet chip didn't appear to be an encumbrance. Yes, I was prepared to be quite forgiving as I spent most of my time with it presuming it cost £400, which even then seemed a bit on the high side. It was only later I discovered its £500 pricetag, which rather took the shine off things for me. Surely, if you're touting a product as a Lite model, it really should be light on the wallet too – and especially so if you've something to hide. Samsung's Ativ Book 9 Lite is only around one-third the price of the Plus model. This means a plastic chassis and cheap screen and processor, while keeping an impressively thin and light form factor. Component downgrades mean this laptop is no powerhouse but it does the job well and few laptops at this price are so thin and light. Overall, despite a first-class keyboard and touch pad, a sleek design, and booming speakers, the Samsung ATIV Book 9 Lite disappoints in the most key regard—everyday use. The torpid performance delivered by its AMD processor makes even basic tasks frustrating. Sometimes it's pretty hard to tell what constitutes "low-cost" in a laptop. Samsung’s latest budget spin on a Windows touch-screen, AMD-powered, ultrabook-esque laptop has some flair, but the corners it cuts aren't worth the money saved. Samsung’s ATIV Book 9 Lite is an interesting, but failed, experiment. There are many things that we like about it; the keyboard is easy to love, the chassis is slim, and build quality is good for the price. If the Lite sold with a fourth-gen Intel Haswell processor, even a slow one, it’d be a serious contender in the budget Ultrabook market. At £600, the Samsung Ativ Book 9 Lite is a rather expensive bit of kit for general use such as web browsing and word processing: these are tasks you can do with a £300 entry-level notebook, for example. However, what you're paying extra for with the Ativ Book 9 Lite is its slimline design, portability and, unfortunately, its touchscreen, which is let down significantly by mediocre display quality. It just depends whether you think portability is worth the extra money or not. Whichever of the two models you decide upon, the ATIV Book 9 Lite is a heartening vision of what’s to come. When you can buy a quality Ultrabook clone such as this for £600, and crucially without first having to wait months for the prices to tumble, the future looks bright for the budget laptop. The Samsung Ativ Book 9 Lite is a budget ultrabook based on the Samsung Ativ Book 9 series of premium super thin machines. In order to save money, the body is made from plastics instead of premium metals and it is powered by an AMD processor instead of the latest Intel cores. Technically it cannot be called an ultrabook, since that name belongs to Intel. Immediately, the user will notice how this machine feels. It looks sleek enough, but it cannot run away from the plastic styling that makes it look and feel like a budget laptop. The keyboard layout is good for a 13 inch machine and the keyboard is relatively comfortable to use. The 1366x768 pixel resolution is decent enough, and the touchscreen works well enough. The colors and definition are not amazing, but this can be expected on a budget machine. The AMD Quad Core processor with 1.0 GHz performs reasonably well for most light tasks, but multitasking and heavier tasks will find this machine wanting. At this price point, there are definitely better alternatives out there. The battery life is rather disappointing, and perhaps the second most significant letdown of not having the power saving Intel processors onboard. While most similar machines out there will get you 8 hours of use, this machine manages only 5 hours. If the Samsung Ativ Book 9 Lite had been priced even lower than its current "budget" price, it would have been good value for the money. But as it stands, there are better options to be had. Series: The Samsung ATIV Book 9 Series consists of high-end ultrabooks. It was released in 2013 as successor of the Samsung Series 9 laptops. The models feature up to an Intel Core i7 processor, 8 GB of DDR3 RAM. Depending on the model, the integrated Intel HD Graphics or one of AMD’s latest graphics cards is used. In addition, there are a few SSD size options. The laptops either feature a 13.3 inch touchscreen with resolution of 1920 x 1080 pixels or even a bright and contrast-rich Quad HD screen. The Samsung ATIV Book 9 Series models belonged to the first ultrabooks which supported Microsoft Windows 8’s touch functionality from the start. However, there is also option to choose a non-touch screen. The Samsung ATIV Book 9 Series has either Microsoft Windows 8 Professional 64 bit or Windows 10 pre-installed. Thus, there is no installation needed upon purchasing. Starting from 2.6 pounds (1.17 kg), the Samsung ATIV Book 9 Series models belonged to the lightest laptops at that time. 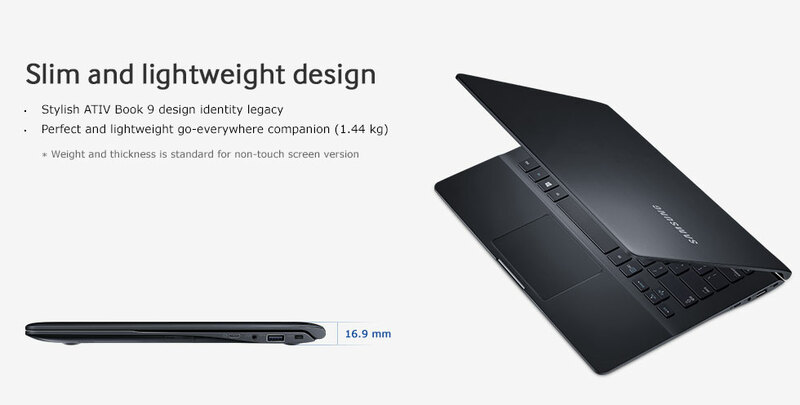 The laptop is also quite thin at only 0.5 inch (1.27 cm). For wireless connectivity, it has WiFi and Bluetooth built in. As for input/output ports, it features two USB 3.0 ports, a mini DisplayPort and an SD card reader. AMD Radeon HD 8250: Integrated graphics card of the AMD A6-1450 APU ("Temash"). Based on the GCN architecture, integrates 128 shader units and is clocked at 300 - 400 MHz. Only some 3D games with very low demands are playable with these cards. » Further information can be found in our Comparison of Mobile Graphics Cards and the corresponding Benchmark List. Quad-core APU for ultraportables and tablets. Codenamed "Temash", it is based on the Jaguar architecture and integrates a Radeon HD 8250 graphics card. 65.09%: This rating is bad. Most notebooks are better rated. This is not a recommendation for purchase.